Neighborhood School Readiness Teams support young children’s successful transition to kindergarten. Teams are made up of educators and administrators from family child care, child care centers, preschools, Fairfax County public elementary schools, and representatives from local government agencies and other community and faith-based organizations. 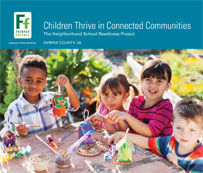 Together, the teams identify the needs of neighborhood families and develop the relationships needed to effectively support young children and their families as they transition to kindergarten. Neighborhood School Readiness Teams are operating throughout Fairfax County. For more information, please contact Fairfax County’s School Readiness Coordinator at Elisabeth.Closter@fairfaxcounty.gov. Our Neighborhood School Readiness Teams develop the relationships needed to effectively support young children and their families as they transition to kindergarten.